??? How often do you find yourself with a wet dog or cat at home? Please share your experience in the comments below. 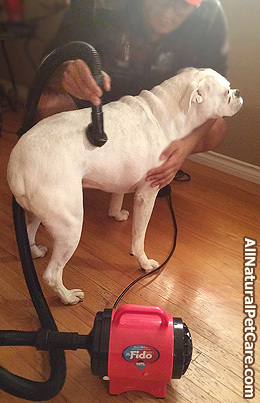 4 Responses to "Review: B-Air Fido Max 1 Dog and Cat Dryer"
Thank you! It was a much neater winter thanks to you and Bair! We have 4 dogs in Vancouver. We’re supposed to get lots of snow this winter. Last year our new terrier had a horrible time with snow balls clinkging to his fur. He shivered for a long time after coming inside and the water was everywhere! I’m hoping to change our experience with this handy dryer! You should see my dog after I bought this (thanks to you). She barked and ran around…….she thought it was a fun new toy LOL. Works great if I can get her to sit still! Thanks for the review, I couldn’t find much about this particular dryer online. I ordered one yesterday and I look forward to less puddles! !